Why you need a SUP leash? • When paddling in moving water with current, tide or windy conditions a stand up paddle board leash will keep the board close to you for quick retrieval after a fall. It’s the only safe way to connect yourself to the leash plug on your board. • A leash is not only for whitewater, paddle surfing and downwinder paddlers; A fall while flat water paddling in a light breeze can separate you from the board in seconds, especially if you push the board away from yourself as you fall. • Whether you are racing or casually paddling, a leash will stop your board from crashing into a nearby person after a fall. • Casual flat water paddlers can find themselves in unexpected waves, gusty winds or strong currents. If you fall, your paddle board could become your life saver—but not if it’s floating away. Your SUP leash keeps your board within reach. Follow this link for more on SUP safety. What style of SUP leash should I choose? Safety needs, common sense and comfort will help you decide what style of leash to use. • STRAIGHT - (ankle or calf/knee leash) - surfers prefer the straight style over coiled to decrease the chance of tangles and for minimum drag. • COILED - (ankle or calf/knee leash) - good for flat water and distance cruising and racing, so the coil stays on top of the board. • BREAKAWAY or QUICK RELEASE - (waist or calf/knee leash, or attached to a pfd) - a quick release SUP waist leash provides additional safety by allowing the paddler to break away from the board should the leash tangle with a submerged object, threatening to pull the paddler underwater. How long should my leash be? • Choose a leash 1ft longer than your board for optimum distance in the event of a fall. • A leash that is too short for your board could shoot back to strike you. • A leash that is longer than your board will take a little longer to retrieve, but is much safer. • Most definitely. 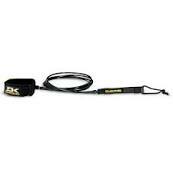 SUPs are much heavier than surfboards therefore need a sturdier, stronger leash. If you are surfing or traveling at high speeds on a SUP, be sure to match the strength of the leash to the weight and style of the board. • When transporting your SUP on your vehicle, remove the leash rather than wrapping it around the tail fin to prevent fin cuts and UV damage to the poly urethane leash material. • If you’re walking any distance with your board, wrap the ankle strap around your wrist and wrap the your leash around your arm several times to secure it. This works particularly well with a coil leash. For a straight leash carry a velcro wrist strap—use the strap to secure the leash once you’ve rolled it up. • Be prepared. Carry a spare leash, especially if you are engaged in surfing, downwinders, or racing. Leashes can tear from constant pressure, get cut from the fin, and stretch and snap or break at the swivel. • Before you go out for a paddle, check the length of the leash for weak spots and check all moving parts and connectors. Be sure to change the velcro when you can see it is getting weak. How to attach a SUP leash to you and your board. So: which leash is for me? Below are the things to consider when choosing your leash for your style of paddling. Be sure to view the helpful YouTube videos!